3/8” thick phenolic composite drawer fronts come standard in black. Wood grains are available in special order quantities. Drawer front features weather stripping for extreme durability and a weather resistant barrier. Compression lock arm engages behind aluminum frame for added security and to help seal drawer front to unit. 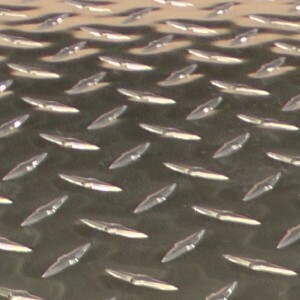 Non-Skid, rubber top surface with protective metal trim applied to a sealed, composite top. 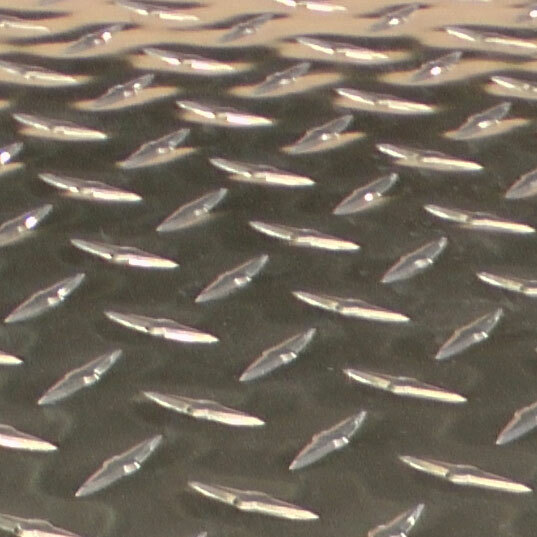 (Optional) Diamond Pattern Aluminum Top replaces composite and rubber surfaces. A ¼” thick composite outer shell surround the storage unit for extreme durability and security. All the exposed seams have been sealed to keep water and dust out. Includes sealed bottom panel to completely enclose drawer unit. 18 gauge metal drawers that are bent and ribbed for maximum stability. A composite drawer back is added to stiffen and balance the drawer. 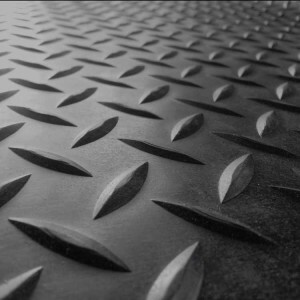 Metal is finished with a weather resistance paint. 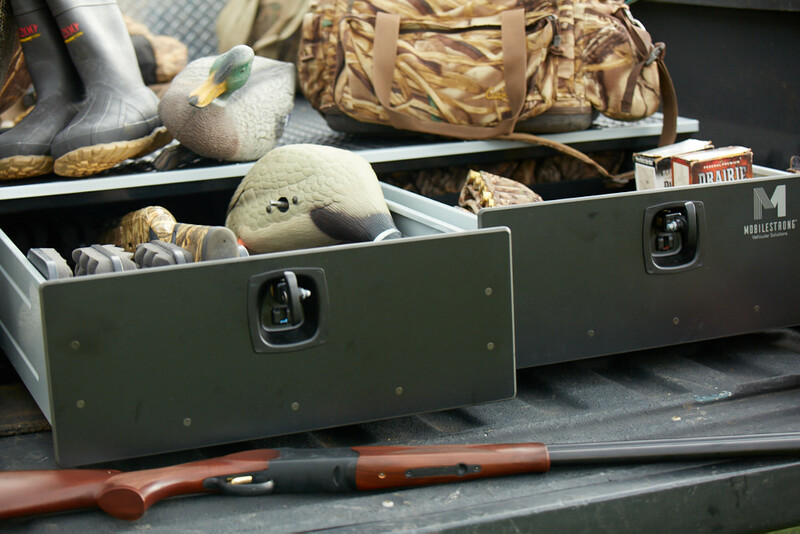 All truck bed storage drawer units are equipped with Compression T-Lock Mechanisms to help protect guns, gear, tools and other valuables. Storage drawer units with 2 locks will be keyed alike for convenience. Optional: Combination lock and separate pull handle. All truck bed organizers include 4 Spring-Loaded, D-Ring Tie Downs built in and sealed into sides of unit. It is recommended that the Storage Drawer Unit be secured to the truck bed. No tools are needed for installing storage units in vehicles. For the most part, they are light enough for 2 people to slide in and out of the vehicle as needed. It is recommended that all storage drawer units used in a truck bed be secured to the bed. D-rings are provided for easy fastening. 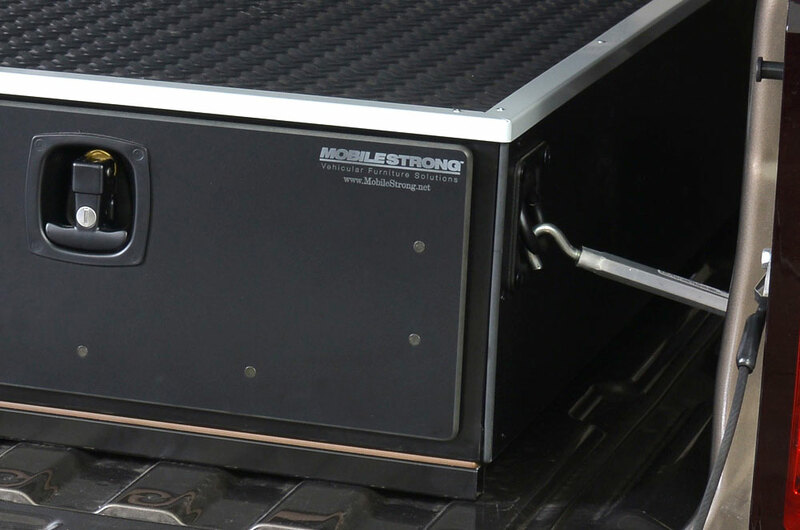 Our Truck Bed Storage Solutions are constructed with superior quality in mind. Read more about our construction materials and methods.